Dine-in Atmosphere: For those of us that remember our old pizza haunts back before we could drink, where you’d go in, sit at a table with a checkerboard tablecloth and order cokes while you waited for your pizza to come out on a round metal tray. 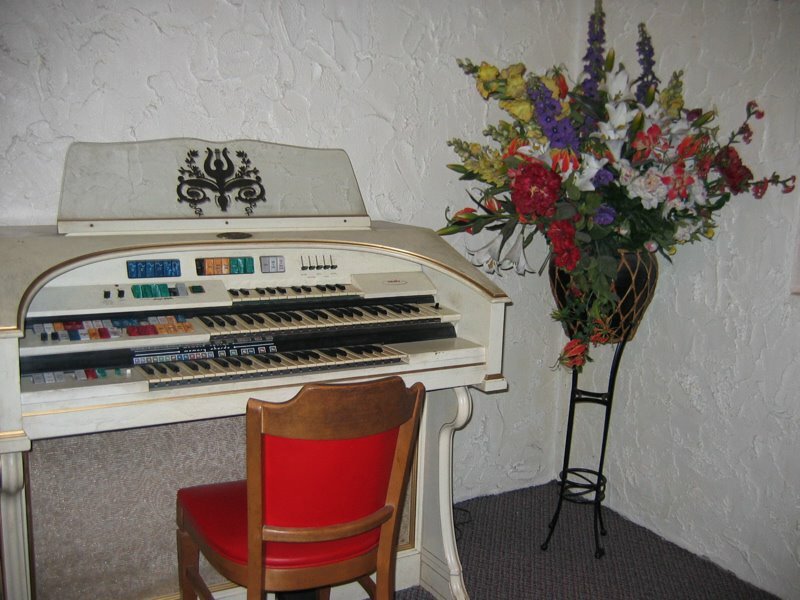 You know, the old-school pizza place: simple walls, magazines on a counter and maybe some sort of cheesey relic in the corner that was never used but you knew probably still worked. Well that’s Enzo’s. Just a place to go and eat a pizza with friends where you order a couple different pies, try a piece of each until you find your favorite and then proceed to bust balls and laugh at one another. 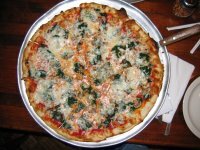 It also is connected to a great little dive bar (PS Lounge) where you can either sit and wait with a beer for your pizza to be done or you can just have the pizza brought over to you so you don’t have to leave the bar. It’s a great set up. The only thing missing is one or two coffeetable style arcade games, like Galaga or Ms. Pacman, that you can play to pass the time as well. Well I guess we can’t have everything. Review: Enzo’s is located on East Colfax Avenue and Madison Street, a couple blocks east of the Bluebird Theater and nearby a bunch of new bars and restaurants that have popped-up over the last couple of years. It’s a good starting point for a night on Colfax hitting bars, getting a quick bite before a show at the Bluebird or just dining in and maybe hanging out listening to the high-quality jukebox at it’s atttached bar, The PS Lounge. In any of those cases, you cannot go wrong including Enzo’s into your plans for the night. 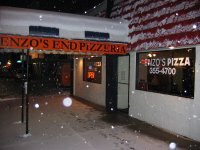 Full disclosure: I have to say that I probably order a pizza from Enzo’s once a week. Sometimes I go two but never three weeks between visits. 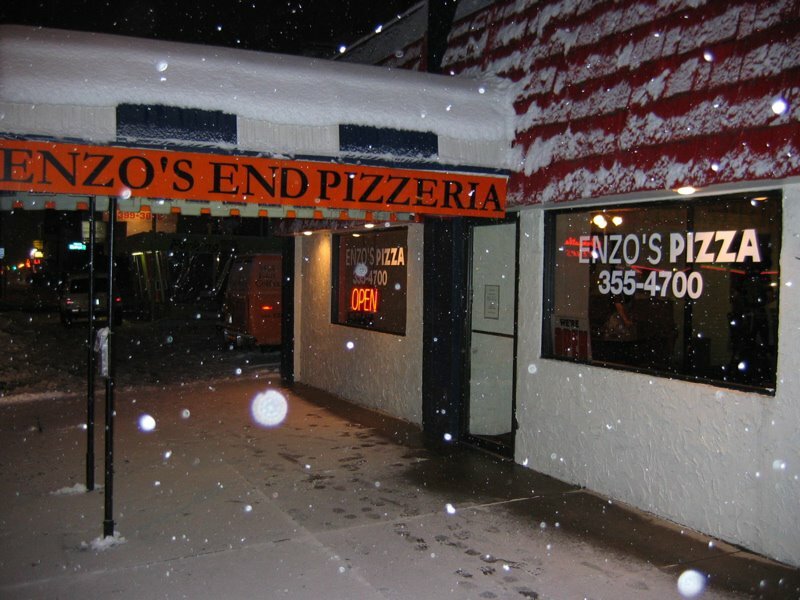 If that doesn’t give you an idea of what I think about Enzo’s pizza, then there is no help for you. 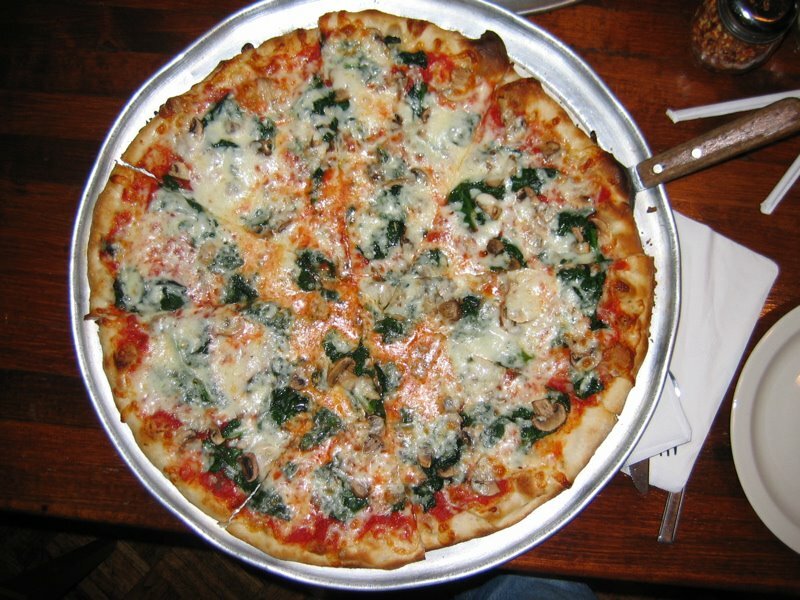 But to be helpful I’ll say this: It is not only “Denver’s Best Thin Pizza,” it’s Denver’s Best Pizza. Sure, other places have good thin pizza but none of them have the combination of factors that puts Enzo’s at the top of the pizza in Denver class. Enzo’s has the thin crust, I think that has been established but it’s not just that it’s thin, it is crunchy as well, bording on burnt in some spots. The crust also has the little bubbles that form during baking, always a sure sign of a quality thin crust. And it’s foldable, another must have for those of us that love the New York style. But like I said, Enzo’s pizza has a combination of factors that makes it great. 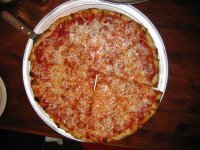 Along with the fantastic crust, it has it’s base, marinara-style sauce that is just spicy enough to get your attention but not so much so that it overwhelms the flavors of the toppings you put on. And it is perfectly applied to the dough, where it doesn’t drip on you while you eat it. For me, that’s a huge plus. Now for the toppings. Enzo’s has a wide selection of toppings that make it impossible to have the same pizza for quite awhile if you so choose. Along with the standard sausage, pepperoni, mushroom, black olive, etc toppings, Enzo’s has five different styles of cheese available for those times when one layer of Mozzarella just won’t cut it and a good selection of not so typical toppings that everyone has to try at some point in their pizza eating life. Veggies such as spinach, red peppers, roasted eggplant and articoke hearts make for an interesting flavor when coupled with jalapeno’s, green chiles or meatballs. Oh, and let me take some time out to talk about the meatballs that Enzo’s serves. I’ve looked long and hard for a pizzeria that prepares a meatball for a pizza properly and Enzo’s is that pizzeria. Most places put on their meatballs right on top from the start of the baking process. This creates a two-fold problem: 1) The meatballs, while warm, are now hard on the outside from being overcooked, and 2) all the flavors (spices and whatnot) are cooked out of the meatball. Enzo’s takes a little bit different approach in that they put their meatballs on after the pizza has been baking for some time. How long that actually is, I could not tell you, but in any case, their meatballs are cooked perfectly, just like you would expect a meatball to be when you order spaghetti and meatballs at an Italian restaurants. 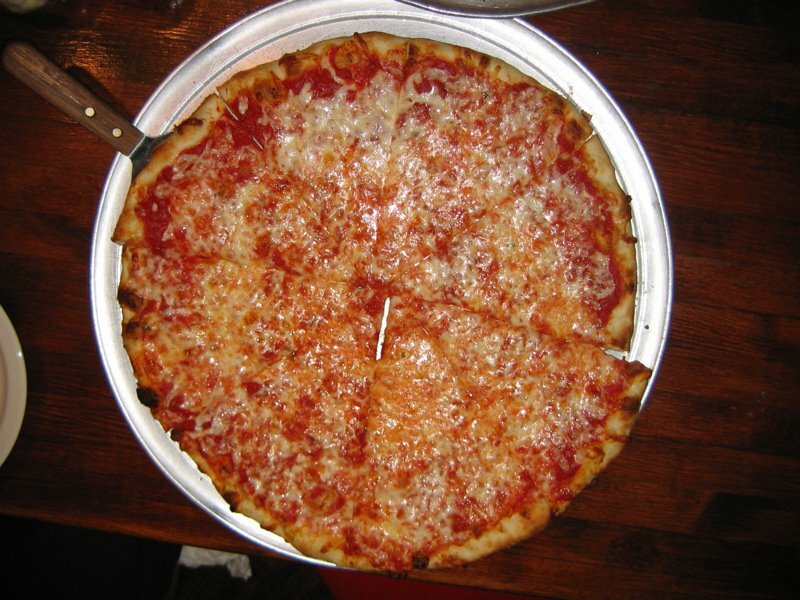 The finished pizza itself is also a bit different from the more traditional New York style thin crust in that it has very little grease. 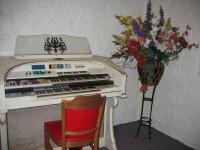 I know some of you (Gavin) think that that is a travishamocary, but for me, I like it. Don’t get me wrong, a greasy pizza is good now and again, but if you want to taste everything on your pizza, the less grease the better. Enzo’s also has a small selection of speciality pizzas that allows eaters to load up on toppings and on most of them, try the lighter white sauce (olive oil, garlic, spices) instead of the traditional red sauce. These pizzas, especially the Pomodoro, really show the range of pizza making that the staff at Enzo’s takes great pride in. They are simply some of the best pizzas I have ever had. Now, you might think that I’m exaggerating. That could be true; it’s been know to happen. But I know this: I’ve been eating pizza for most of my life and not since I was a little kid have I ever had pizza from the same pizzeria for as long as I’ve been eating at Enzo’s. And I’ve tried to find other pizzerias around me that I could have to mix it up a bit, fearing a burn out on Enzo’s. It just hasn’t happened yet. Either the crust is a bit too soft and doughy or the sauce is too spicy or not spicy enough or there is too much or not enough cheese. No other pizzeria I’ve since discovered or gone back to has the complete combination of quality as Enzo’s. I simply haven’t been able to knock them off their pedestal. I’m not sure I want to. This entry was posted in Awesome, New York-Style, Thin Crust and tagged Awesome, New York-Style Thin Crust. Bookmark the permalink. You are absolutely correct. I had a white pizza with artichokes and tomatoes last night and I never wanted to stop eating it.